Contact Owner Ray 724-350-7506 or raydami@hotmail.com. Twin Cummins 370hp diesel engines have 600 hours. Rebuilt generator Westerbeke 12.5 with less than 10 hours. 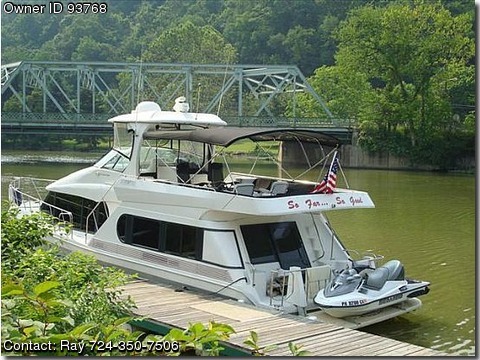 Three marine air conditioners, Raymarine electronics (Radar GPS Autopilot), full galley (refrigerator, convection/microwave oven, dishwasher, trash compactor, washer/dryer), Hydraulic swim platform, Windlass with 200' of chain rope, dual helms, full cover bimini, three TVs, sateliite TV antenna, two staterooms with full baths. Beautiful, spacious, well maintainted yacht.